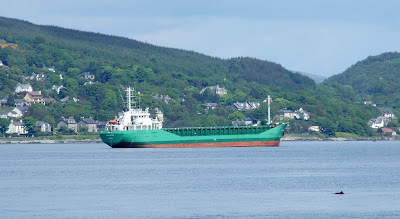 Lying at anchor off Kilcreggan today was Arklow Shipping's ARKLOW SEA, one of a series of coasters built in Holland by Barkmeijer Stroobos. This 4,351 tonne deadweight ship was completed in 1998, and she has an overall length of 89.99 metres. She arrived early this morning from Belfast, and after spending the day at anchor, continued up the Clyde tonight, presumably to load scrap metal for export. Breaking the surface in the right foreground is a harbour porpoise, a common sight in the Clyde nowadays. Superb shots as usual and I thought I was going mad when I seen similar the last time we were out.